Welcome to the next generation of design and engineering. We’re happy to see you’ve made it here. We’re pleased to present Siemens NX. The latest release of NX is by far our most powerful and flexible software to date. It should also be noted that NX is bound to no version number going forward, as you will see here shortly. With this latest release of NX, we’ve added new functionality and enhanced many of the innovative features you’ve come to know as a designer. After all, we alway﻿s value the fact that our customers drive many of our features. We always strive to be innovative and want to drive new functionality that will benefit our user’s workflows. If you’re creating the products of tomorrow we’re proud to say that you’ve found the software of tomorrow. First and foremost, let’s talk about NX Continuous Release. Siemens PLM will become the first major CAD/CAM/CAE vendor to deliver products in this way. Starting with this release of NX, this new delivery model will give our customers faster access to new enhancements and quality improvements, while reducing the efforts needed to effectively deploy NX. As we know, NX is built on a modern software architecture, developed with a business focus on delivering new functionality while protecting customer data. The new approach will enable NX customers to receive functional enhancements faster to help boost productivity, give the ability to have a predictable schedule for updates to better plan for the adoption of new technologies, be responsive to new ideas and trends all while reducing deployment cost. 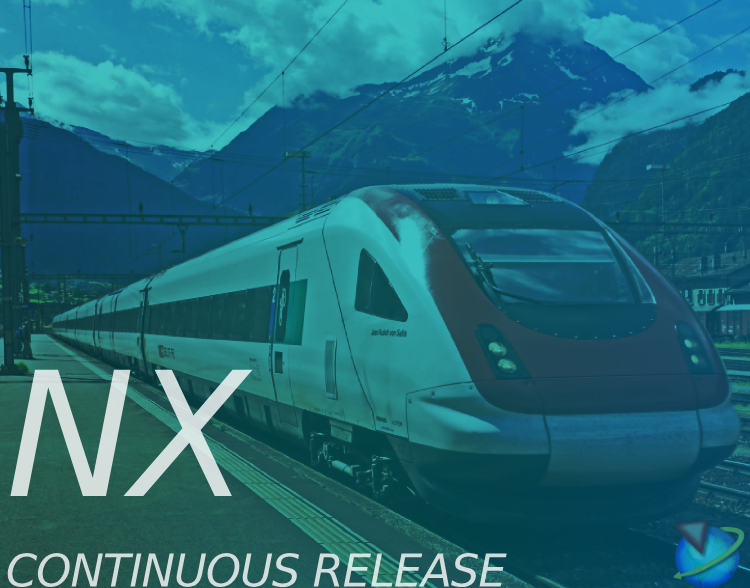 The continuous release method will also give you a quicker and more consistent response from NX development versus release dependent hotfixes. Lastly, another benefit of this continuous release methodology is that you are able to consume our additions and enhancements at a more steady pace. We ensure that we maintain our leadership as the most robust and powerful solid modeler in the market, supporting the world’s ever demanding industries. With this release of NX, we continue to hold this position, by adding meaningful additions and advancements into core modeling. For example, in this new release, you’ll find that modeling within a single part in the assembly context becomes significantly easier through a number of efficiency improvements. Automatic work part changing, an easier sketching in geometry and assembly context, and a show/hide function through the part navigator to name a few. You’ll also find that we’ve enhanced our design tools for additive manufacturing where Convergent Modeling and Generative Design see a significant boost. New to the PMI/MBD area of NX, PMI Compare dramatically reduces PMI and model view checking time by quickly and easily identifying changes you will find some new tools to help you out. Apart from the new user interface enhancements that will simplify navigation and improve your productivity, you’ll find two new exciting features. A PMI compare function that will allow you to easily and quickly identify changes from one PMI model from the other. This will dramatically reduce PMI and model view checking time. Another feature that’s included into this release will greatly benefit collaboration with suppliers, manufacturers, inspection/quality teams, assembly teams, and services. When it comes to accessing 3D content across these teams, NX has the solution. With this release, you will find the all new technical data package. You now have the ability to do all of the PMI/MBD up front and then can provide the entire enterprise with your data package with multiple output formats such as 3D PDF’s and JT plus PDF. Another major area that sees additions and enhancements is our into our tooling area. Tooling in NX ensures that you have the most complete and efficient tooling process all the way from design to production. We do so by having the most intelligent automation and process integration. With that said, you will see many new features such as improved tool design workflows, new cooling and warpage capabilities which will help perform validation early in the product development stage, usability improvements for standard parts which are accessible from the reuse library, and a new NX Feature2Cost function. For many mold makers it’s always hard to predict how much time and cost will be invested when coating molds. Sometimes these efforts from the designer will go to waste….and so will all the cost invested. That’s why we’ve introduced NX Feature2Cost which will allow you to have a whole new set of capabilities when identifying features for plastic necessary for tool cost calculation. You can identify geometrical parameters such as surface area, volume, and wall thickness. You will also be able to identify features such as ribs, openings, and undercuts. All of these are automatically recognized using our advanced recognition capabilities. These features can then be seamlessly transferred to Teamcenter product costing application which will then calculate the tooling cost. NX Feature2cost occurs in one environment. This will eliminate dependencies from 3rd party applications. Remember that we have many resources available to you as a NX user. Our knowledge base includes every single enhancement into NX across all design areas. If you are ever looking to learn about an enhancement or freshen up how to do something within NX, then this is your place to visit. If you’re ever in need of design help than look no further than the NX design forum. NX users around the globe are readily assisting each other with their design needs. Just another reason why the NX community of users is the best. With this latest release of NX it’s quite hard to narrow down our favorite features. From design, all the way to virtual reality, every single area within NX CAD has seen additions and enhancements. Don’t miss out on upgrading to the next generation of design and engineering. Let this be your tool. NX will always be able to seamlessly transfer your designs to our simulation and manufacturing tool sets. We are the only tool in the industry to support a true end to end workflow. Now, with continuous release going forward, it’s never been a more exciting time to be a user of NX. We want to know…will you be upgrading to the next generation of design and engineering?